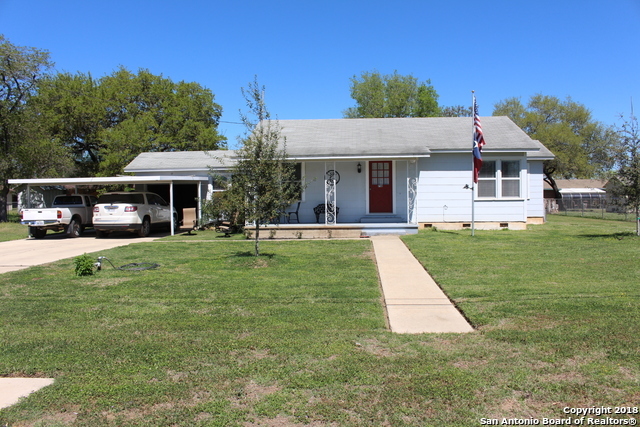 All Devine homes currently listed for sale in Devine as of 04/23/2019 are shown below. You can change the search criteria at any time by pressing the 'Change Search' button below. 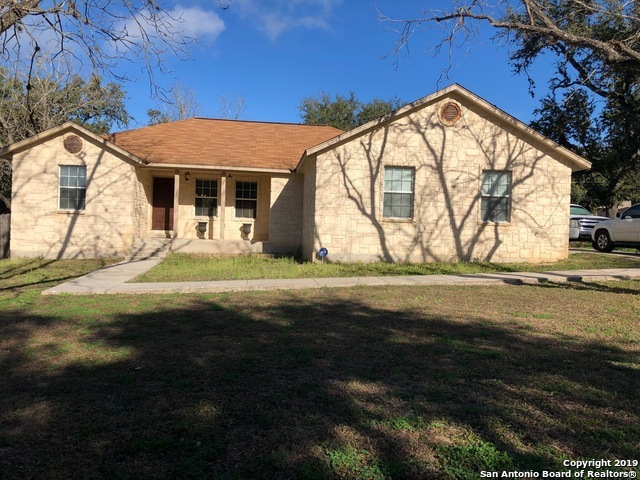 If you have any questions or you would like more information about any Devine homes for sale or other Devine real estate, please contact us and one of our knowledgeable Devine REALTORS® would be pleased to assist you. "Well-crafted, quality construction, custom home w/ high ceilings, spacious living room w/ FP, formal dining + breakfast area w/ bay windows, office & and upstairs bonus room w/ 1/2 bath & outside deck. Energy efficient w/ high quality, double paned windows and a geo thermal heating and cooling system. 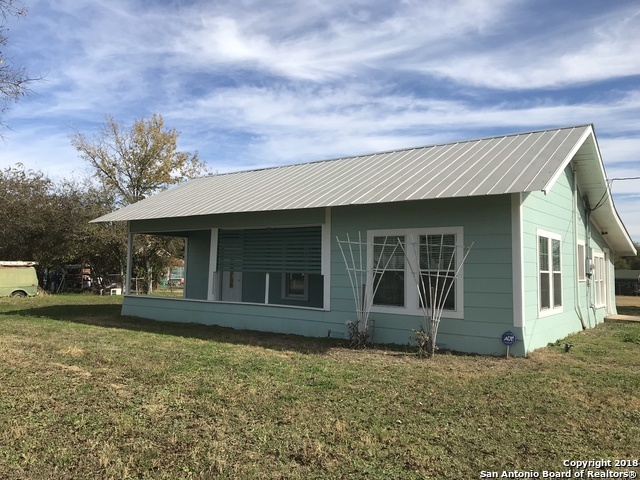 15'x40' metal building w/ electricity + access to water/septic for RV storage & 25'x20 metal shop with electricity (to include 220) + an air circulating filter throughout the shop. Mature manicu"
"Amazing 4 bedroom custom home situated in small golf course community. Floorplan offers an open kitchen & living area with access to large covered patio. Garage is a car enthusiast dream with 12 ft ceilings (room for lift) proper outlets for welder & compressor, commercial roll up doors, 1/2 bath. Great features include, rustic stained cabinetry, doors & header beams, stained concrete floors, Bali cordless blinds, stone accent walls & fireplace, granite in all baths, established landscaping." 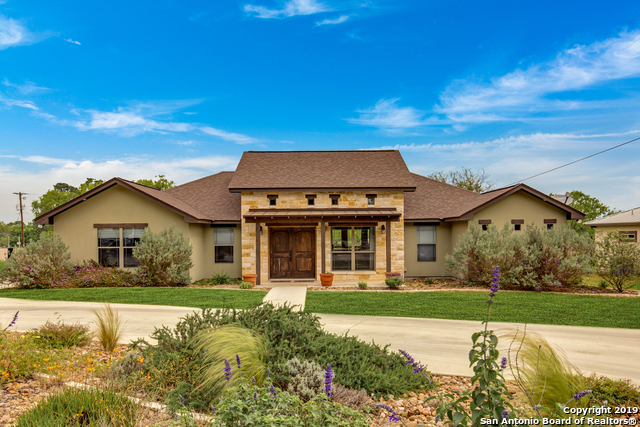 "Mediterranean style home has the WOW factor inside and out - Elegant 4 bedroom/2 1/2 bath home with tall ceilings throughout - a floor plan you will love and the huge oaks trees this golf course community is know for. You get to live in a golf course community but have privacy with a amazing back yard that boasts an oversized covered patio, pool, and hot tub perfect for entertaining. 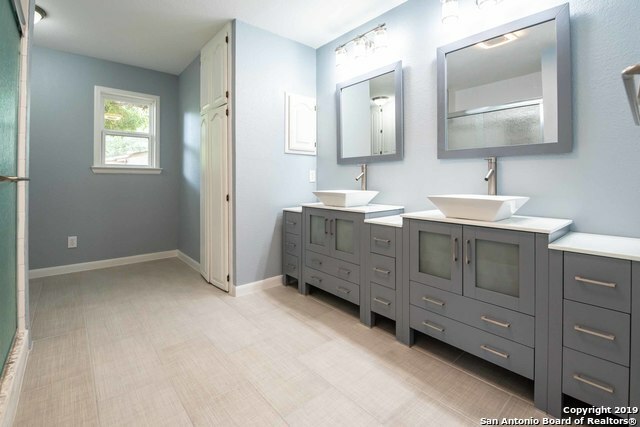 This updated and meticulously cared for home also features an over-sized garage, hidden storage building and pe"
"Come check out this Golf Course gem nestled amongst oak trees and beautiful landscaping. This home is located on prime golf course real estate without the city taxes." "Beautiful spacious 3 bedroom. 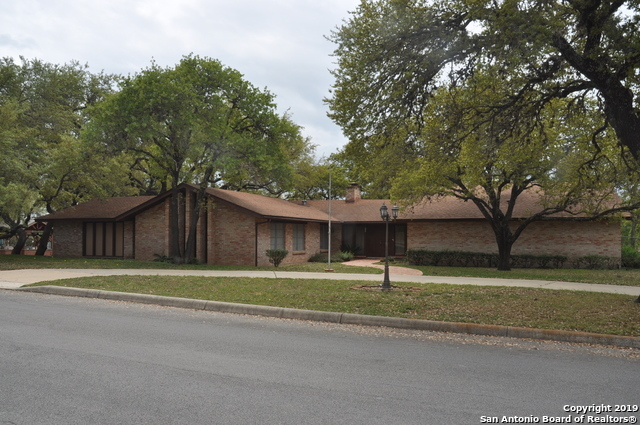 2 bath home that sits on 2 1/2 oak covered lots in Devine - offers vaulted ceilings in 2 living areas, large kitchen and formal dining room - brick fireplace in living area - large master suite with walk-in closet and on-suite bathroom. Nice large fenced back and side yard that offers detatched covered patio and sprinkler system. Covered attached 2 car carport, circular drive and additonal guest parking area. This one is a must see!" "This stunning 4 bed, 2.5 bath features and open floor plan with granite counter tops in the kitchen and bathrooms as well as hardwood and tile flooring throughout. Attention to detailed was not spared as it is showcased in the stone fireplace and elegant chandeliers that dangle in the 2 of the bedrooms as well as in the living room. You can relax on your back porch under the pretty arbors as you look out onto the golf course. Schedule a showing today!" "This beauty is ready for move in! Located across from the park, this home has been completely up-dated inside and out. The main home offers 3 bedrooms with two having attached bathrooms. You can also find 2 living areas, plus a media/game room, a kitchen loaded with cabinets, and large dinning area. The guest suite offers 1 bedroom, a full bathroom, and kitchen/living room space. Out back is a great spot where you can enjoy the covered patio and large yard, plus storage area." "Enjoy the country life! This property is loaded with potential! 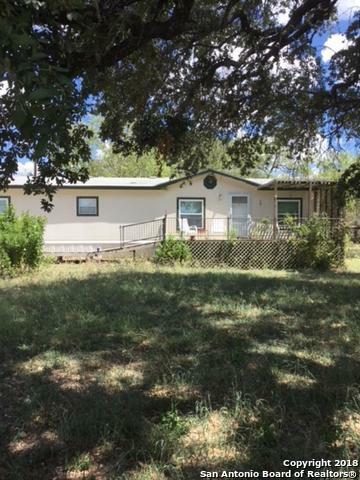 A 16X72 Singlewide manufactured home, oversized shop, covered parking, working pens, dog kennel, fruit trees, native trees, BMA Irrigation & 18 ag exempt acres." 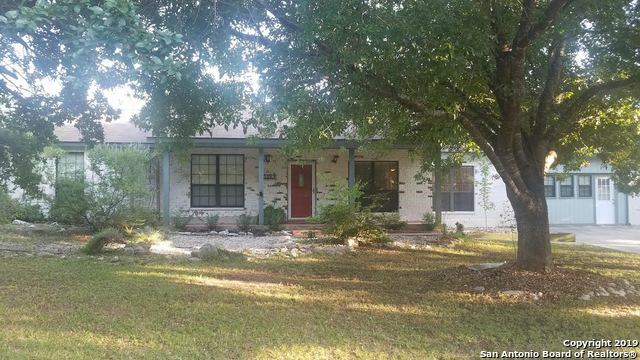 "This home sits on two city lots at the corner of Hwy 173 and FM 2200. It is within walking distance of the High School, Elementary School, and Middle School. The property has been recently rezoned and can be used for commercial. The main home is currently tenant occupied. There is an attached remodeled one bedroom apartment that has income potential as well. The interior photos attached are of the one bedroom apartment." "Hurry-Hurry great area of town-nestled under mature trees with front an back covered areas for enjoyment-open floor plan with updates in kitchen/master bath plus other positive features-converted garage for extra bedroom or other use (20 x 20 area)"
"VERY NEAT, SPACIOUS HOME WITH LARGE BEDROOMS AND HUGE KITCHEN; SECOND STORY INCLUDES BEDROOM AND WONDERFUL, QUIET LOFT AREA FOR PRIVACY; EXTERIOR AMENITIES INCLUDE 1/1 GARAGE APARTMENT, CARPORT, WITH WORKSHOP AREA; PROPERTY HAS NICE FRONTAGE ON STATE HIGHWAY WITH COMMERCIAL AND/OR RESIDENTIAL USES; NO RESTRICTIONS"
"This Beautiful Home has all the charm of country living. Open floor plan, granite counter tops, custom cabinets, spacious closets and more. Nice yard with Huge Trees. 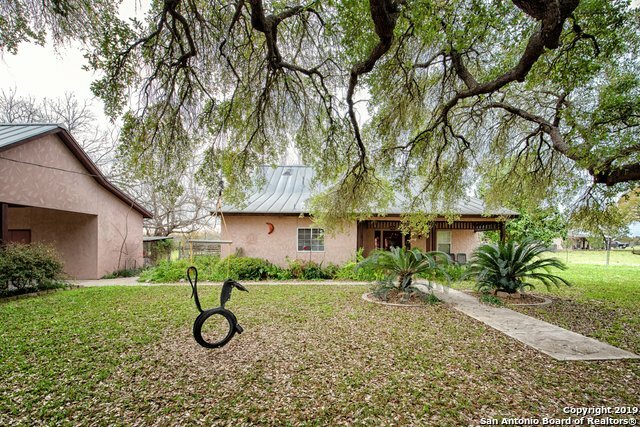 Minutes from shopping and only a short distance to San Antonio. If you like to Golf its only minutes away with a Clubhouse . Come view this Home it won't Last Long! Thanks for Viewing. OPEN HOUSE March 23rd 11:00 to 3:00 See you there!!" "New Home - 4 Bedrooms 2 Bathrooms on 1.49 Acres Large Majestic Oak Trees - New Gravel Drive - 6 Pad - Lot will be Cleared & Look Park Like - In Addition to the Land & New Home the Property will be Fully Fenced with New Gated Pipe Entrance Painted to Match the Home, Front Deck, Back Landing & Stairs, Upgraded CFB Skirting, Upgraded Insulation, Dual Thermopane Windows, Appliances, and Seller Provided Certificate of Retrofit - Pictures for Reference till Home Arrives On-Site - Apt Only Clearing in "
"This is a charming and well maintained 3/2 home with an office and 2nd living room area was recently rezoned from Class A Single Family to Class G Retail Business. Front living area is open to breakfast area/kitchen. Plenty of space for entertaining or family gatherings. Nice size yard and close to area schools." 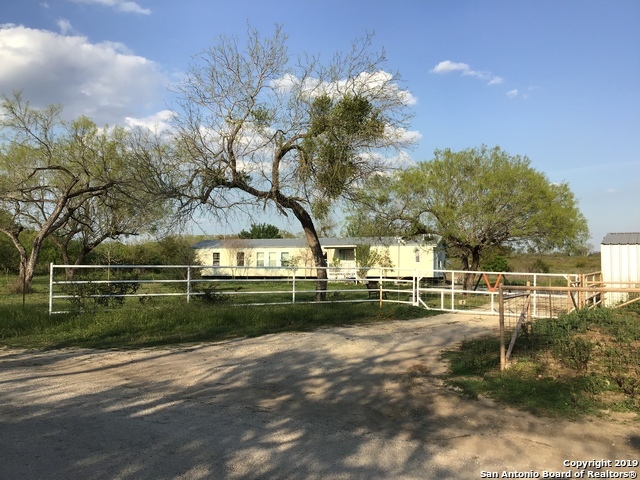 "2 homes on an acre in Devine, TX! 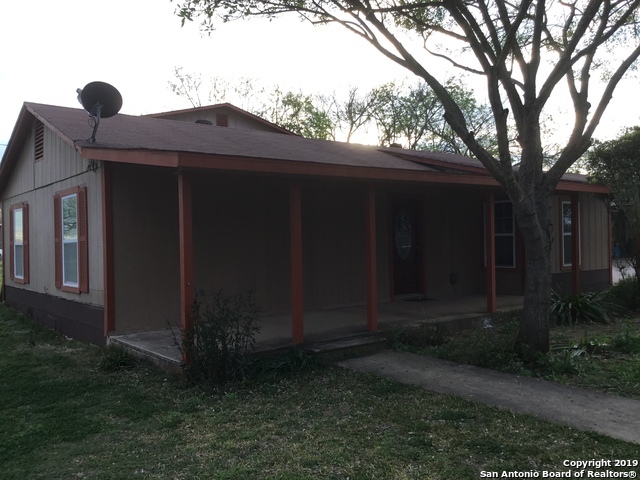 3 bedroom 1 bath and also a 2 bedroom 1 bath. Multiple sheds. Mature trees. Water meter and water well. Manicured yard and much more." 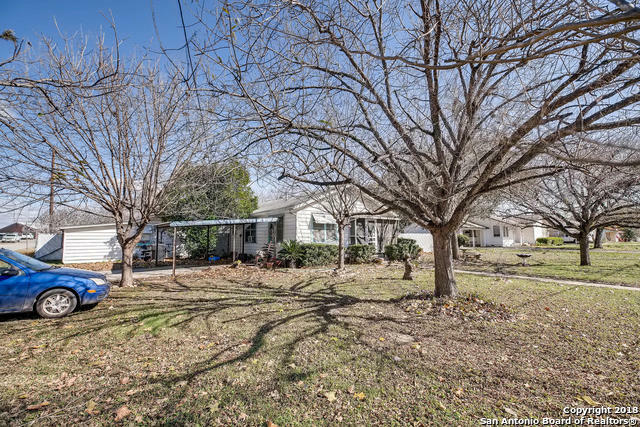 "Enchanting 3/2 home sits on 3 centrally located city lots, large dining area, enclosed porch, eat-in kitchen, fenced yard, large storage building, 2 single car carports, endless potential..."
"Great home in quiet neighborhood, just a few blocks away from the baseball fields. Spacious backyard! Recently updated floor and countertops! Come check it out before it's gone!" "This unique 5700+ sq. ft. home and large lot has enormous potential as a 7 BR/6 BA home for a large/extended family, or can be divided into several apartments as an investment property! The RIDICULOUS LOW PRICE OF $28/sq. ft. ALLOWS FOR MAJOR REHAB AND UPGRADE! Property boasts covered patios, tons of parking space, circular drive, mature trees, 2 fireplaces, screened porch, etc. Green space on east side and behind provide extra seclusion. PHOTOS TAKEN WHEN HOUSE WAS PREVIOUSLY STAGED, NOW A WORK"
"HOME ADDITION OF 156 sq ft (added in 2007) per Medina County Appraisal District isn't included in square footage figure (1,098) above. Charming remodeled home with great high ceilings and open entertaining space! Gorgeous hardwood flooring; Spacious bathrooms; Lots of windows compliment rooms by allowing natural light into home." "Gorgeous, mature oak trees encompass the nice, clean home and multiple workshop/storage buildings located on property;Property includes two subdivision tracts; RV Hookups; Fenced; Home offers open floor plan with kitchen appliances; Front covered deck patio is very inviting with a serene view of neighboring farmland;"
"historical fixer, Charming 1920/30's farmhouse needs a little polish. 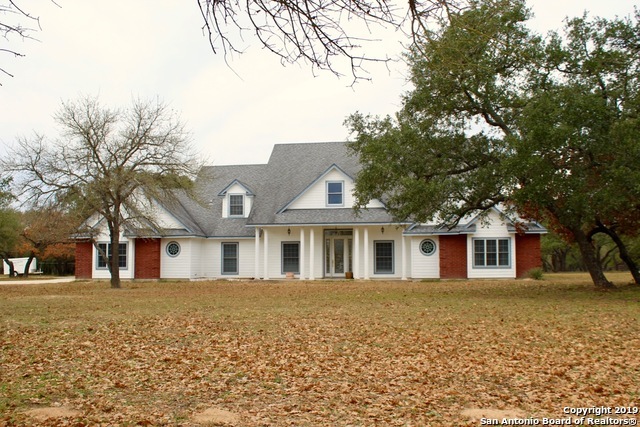 High ceilings, transom windows over doors, large bay window living room to name a few of the features included. 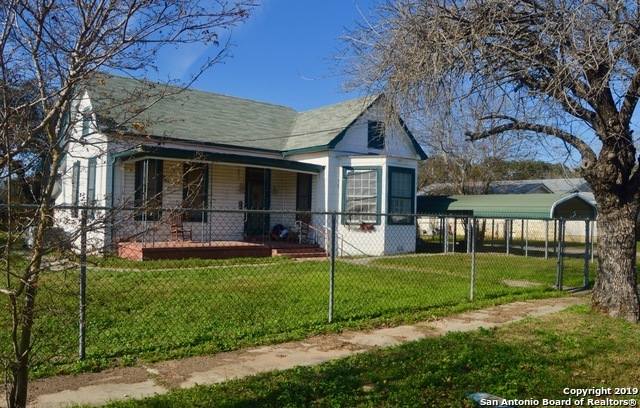 this is a diamond in the rough"
"Investment property opportunity in Devine. Screened in front porch, enclosed back patio, detached building could be workshop (has a sink and basement/cold storage). Other storage buildings on property. Can be subdivided. 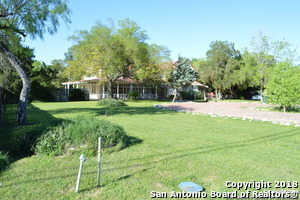 Lot facing Hondo Avenue has the house on it, lot facing Atkins is vacant and undeveloped. Tenant in place until January 2020 with a gross yearly income of $10,200. DO NOT DISTURB TENANT - showings with contract only. Lots 5 & 16 sold together." "Charming home sit on 1 acre just outside city limits. 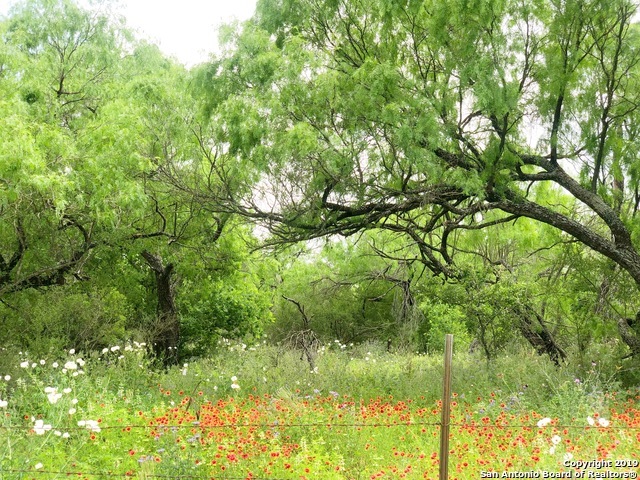 Enjoy the feel of the country being just minutes from town. 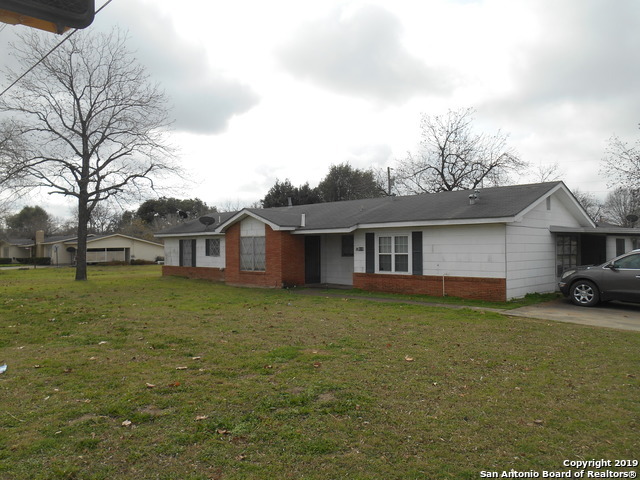 Great starter home or investment property." "REALTORS PLEASE SHOW AND UNDERSTAND HOME WILL BE IN THE PROCESS OF RENOVATIONS IN MARCH AS HOME IS COMPLETED HOME WILL INCREASE IN PRICE."